Even though at this particular moment snow flakes are drifting delicately through the brisk, March air, spring has fully bloomed in Georgia. Blossoming buds on the Bradford pear trees line the roads and most daffodils have already come and gone several weeks ago. Since we had a very mild winter, the forecast is calling for a severe allergy season, one of which Senia Mae and I are currently victims!! All weekend she has been broadcasting the news, "Mommy and I don't feel good" absolutely proud as a peacock that we are lucky enough to share the same miserable symptoms of swollen sinuses and itchy eyes! Then she'll continue on..."I just had to smell the flowers...I love them",as she walks off bantering to herself in a continuous ramble. 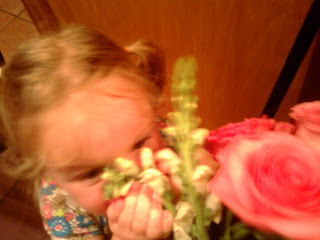 I must admit, she is absolutely adorable as she looks to the bright side of suffering with allergies! The season sent me to Walmart for several boxes of tissues, causing me to pass the aisle of springtime flowering bulbs. I suddenly reverted to a child Senia Mae's age following my grandmother down the grassy hill to a row a beautiful, tall flowers that lined several neighboring Evergreen trees. It was my lesson of the day. The warm hand led me down the hill to see the most magnificent and bountiful blooms I had ever seen. They were purple mostly, mixed in with some white, pink, and yellow blossoms that grew tall on these long, thick stems, higher than my own head! "You can touch them, see?" she said, "But very gently or they will fall off their stems. These are called gladiolas...one of my favorites. And over here we have hollyhocks." She pulled me to the side where more flowers blossomed. I had to listen carefully because she spoke very fast, as if she were in such a hurry to get all of the words out. With her thick Boston accent it almost sounded as if she were saying Hollyhucks, as she showed me the delightful bell shaped flowers that donned its bountiful stems. I thought that I had never seen anything quite so pretty and exhilarating, as I deeply inhaled next to the purple and gold bells. She could make anything grow anywhere. We always had cut up milk cartons and glass jars hall full of water rooting sprouts of this or buds of that. I try to have similar talents, but they don't come as natural to me as they did to her. I still try anyway. Last fall I decided to transplant some irises that had been given to me as a gift from a patients established garden. I thought I would wait until Senia Mae went down for her nap, giving me at least an hour to clear the hill, prepare the soil, and cover the roots so they would be ready for the upcoming spring. After about twenty minutes I was knee deep in a fresh mix of bark mulch, rotting leaves, and potting soil as I glanced down the hill at the glass door in front of Senia Mae's bedroom. I instantly became aware that she was not sleeping, but rather sitting contently by the threshold, gazing up at me while I worked with the irises. Chuckling to myself, I leaped off the hill to see why she was so awake and interested in what was going on outside. Her reply, "Mommy I love helping you dig holes, can't I just help?" I supposed there would be time for napping later, this event was obviously one that was being guided by a higher spirit, with intentions of being completed together at that particular moment. Who could deny the divine? And so it was. We dug our holes for the next forty five minutes, laughing, playing, and enjoying each others company as we became one with mother earth. It felt good to feel so connected; to my daughter, to my grandmother, to myself, and to God. Senia Mae doesn't exactly understand how connected she is to this whole story, but slowly I see the map unfolding in her mind as her own little wheels formulate their own ideas. She picked up a photo of Gram the other day and asked "Where is she?". I let my daughter know that she was named Senia after my grandmother and that Gram was in heaven right now watching over us all of the time. "Oh, my little angel? ", she smiled as she looked up at me with this knowing look of pure understanding. "Yes!" I said, "How did you know that?" She then stated, "Mommy, I just know" reassuring me as she lay on my lap, patting my hand and looking up to the sky. I sat there dumbfounded, realizing that my daughter is already very closely connected, without any outside efforts from me, without force, and possibly without recognition. I begin to feel myself smile on the inside as I slowly come to terms with the order of the universe, one that my three year old is completely and absolutely in touch with! My favorites are jonquils and yes, they are connected to memories of family, of shared rituals, of nature, and of a reminder that we are indeed, connected to the divine, if we just pause and remember. Not only are jonquils the birthday flower that graced the cake my mother made for me every year, but they are the first heralds of spring; the first bright splash of color after a monochromatic winter. They announce the coming of spring - the brightness of longer days, warmer temperatures, and the accessibility of happiness through all the natural elements of earth, fire, and water. I love jonquils as well. Maybe I'll pick some up tomorrow!